It’s true in many ways that traveling by plane in 2017 lacks much of the glamour and carefree effortless elegance of, say, 50 years ago. We live in a different world with much more complex problems that need to be addressed. But since you have to go through the lines and security no matter what — how about making it as painless as possible? Here are some easy tips to help you breeze through your next security screening. Sounds like stock advice, right? Here are some specifics that can shave precious minutes and hassle off your wait time. Check your flight status before you get ready to leave your house, or download a smartphone app like TripIt that will automatically notify you of any changes to your itinerary. Check in to your flight online. 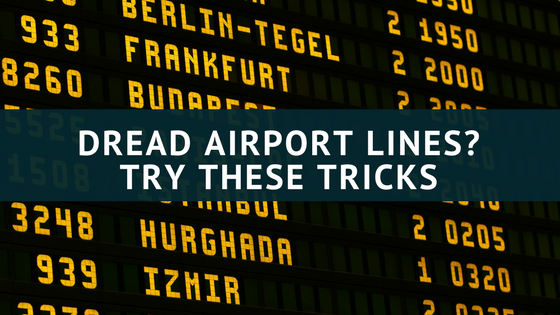 This is especially helpful if you are not checking any bags! One savvy traveler recommends this trick: If you’re staying over in a hotel and have an early morning flight, take your watch or any jewelry, loose change, and any other small items you’d have to take out anyway (like portable electronics), and just put them in plastic baggies in your carry-on. That way, you save the time having to remember and gather them while in line, and they’re all together in one place when you’re through. TSA agents also reportedly appreciate this kind of forethought. While you’re in line, make a mental note of how many bins you’ll need. Take a few seconds to plan out the most efficient way to get your stuff on the belt so you can go through, get dressed, and get out. The TSA has a trusted traveler program called TSA PreCheck that is now available in many airports across the country. It has perks like not requiring shoe or laptop removal for a speedy trip through security. If you have a smartphone, make use of it. Find helpful apps (such as TripIt) that keep all your info organized, that keep you informed, and that have helpful names and numbers (like mine!) at your fingertips when you need them. Program the numbers of your travel agent, airline, car rental service, hotel, and any other contact info into your phone. You can even temporarily organize them all under one name — for example, assign the “last name” of each item as “California Trip 2017,” and they’ll all appear listed in one spot in your contacts for easy access. This way, if a logistical emergency occurs, you have the ability to reach me so I can help you find additional flights, make cancellations, reschedule pick-up/drop-off times, or notify hosts or a front desk of a late arrival. When you have everything organized, and you know you’re ready to go, and all there is left to do is wait in line, make the most of it. Focus on the excitement you feel about your trip. Talk to your kids. Take deep breaths. If you’re not self-conscious, do some pre-tiny-airline-seat stretches. Strike up a conversation if you feel like it. Listen to a podcast. Get your mind in a place that’s positive and productive and set the tone for your trip to focus on what’s working and what you’re thankful for.